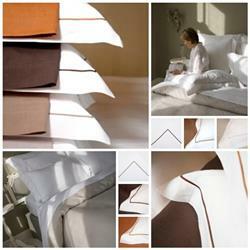 The Bridgewater Bed Linen Collection is made of 100% pure linen top sheets, pillow cases, & shams. They feature a design in solid white finished with a light grey or cafenoir satin cord. Please note that the Spice and Taupe colors are no longer in production. Select Bedding Size euro - 25"x25" Twin (T) - 71"x118" full/queen (T)- 95"x118" King (T) - 106"x126" standard (PC) - 21"x31" King (PC) - 21"x40" King (SH) - 21"x37"
The satin cord color is a perfect match with the sheets from the Santiago collection, allowing it to enrich your bed linen range quite nicely.